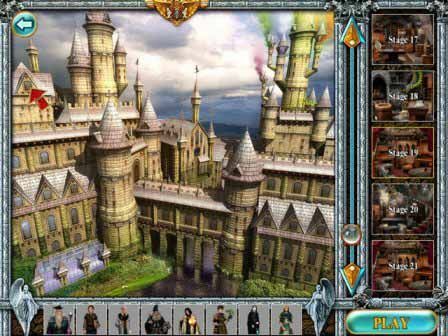 Free download Magic Academy game for PC. It is about the search of hidden objects. The game play is very easy. Magic Academy game is developed by Gametop.com. After installing the game you will find the shortcut icon on your system desktop. Run the game and after loading you have to ask you name to enter. The menu has play, options, credits and exit items. Options item has a little bit features such as up or down music volume and sound volume. Credits are regardings team of the game. At first stage, you have to enter Class Room where the red arrow is marking. First of all, you have to find the hiddent documentation sheets. These sheets will be in the form of open paper and roll paper. You have to find all sheets. You can see the remaining at the top left of the screen with “left 10” format. If you feel trouble to find an item you can click on “Tip” from top left side of game screen. Then you have to find the objects related to you master. In this level, you will see the empty space at the left side of screen. You have to search the item according to this empty space. After completing this level, you will reach the second stage. Now you will see the red arrow near the Sister’s Room. So you have to enter in it by clicking. At first level you have to find difference. Similarly, you have to complete all the tasks to continue this game. Magic Academy is very interesting game to play in your free time. There is a story behind this game. Your sister has disappeared while studying at The Magic Academy. So enter the Academy of Arwindale and start your research immediately. With the help of their tutors learn to remove protective spells, see invisible things and look to the future.